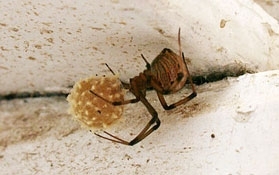 Brown widow egg sacs look something like giant pollen balls. A UC Riverside scientist is asking for the public’s help to track the distribution of brown widow spiders in California. Brown widows’ range, he said, expanded rapidly in Southern California since their introduction in 2003; they may move northward this summer into Central California. The brown widow poses less of a health threat than black widows, but Vetter said there are several reasons why the agricultural community should be concerned about their potential northward migration. Currently little is known about brown widow spider biological control. While black widows prefer low hangouts, it is not yet known whether brown widows will adjust to higher posts in California. If the spiders take up residence in fruit orchards, for example, they could pose a problem for farmworkers. “Pickers and harvesters won’t want to have these spiders falling down on them,” Vetter said. Brown widows could also potentially congregate in agricultural shipping containers or packaging. Brown widow spiders are native to Africa and are established in tropical environments throughout the world. They have been found in Florida for many decades, but only recently expanded their range from Texas through South Carolina, and into Southern California. As of 2009, the spider was established in Los Angeles, Orange and San Diego counties, and in 2010 it made its way to Riverside, San Bernardino, Ventura and Santa Barbara counties. There have been a few finds in areas further north. Vetter is asking the public to assist in his brown widow spider research by carefully following instructions for collecting and sending brown widow spider specimens to the university. Potential spider collectors should study the photos on his website to learn the characteristics of brown widows. Because the spider is already established in Southern California, Vetter does not need specimens from San Diego, Orange, Los Angeles and the Riverside and San Bernardino-Redlands area. More specimens are welcome from Ventura, Santa Barbara, from Riverside and San Bernardino counties outside of the urban cities in the western part of the counties and from all the rest of California.  For spider shipping instructions, see Vetter’s brown widow spider research page. Mechanical fruit thinner may prove to be a money-saving device for farmers. 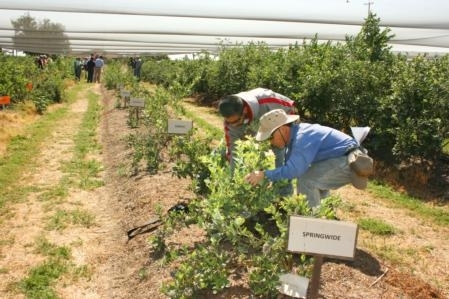 UC researchers are experimenting with a variety of methods that will help farmers reduce the cost of fruit thinning. Peach, nectarine, plum and apple trees typically set a tremendous amount of fruit. The fruit must be thinned considerably to ensure adequate fruit size. Since employing farmworkers for hand thinning is a major expense for farmers, researchers have been looking for a mechanical alternative. One such machine being tested this spring is a “drum shaker,” which was recently shipped to the Kearney Agricultural Research and Extension Center from the USDA Agricultural Research Service’s Appalachian Fruit Research Station in West Virginia. The researchers counted the fruit on the shoots before and after the drum shaker treatment. “Our findings show a modest removal of fruit at 350 to 400 rpm,” Phene said. 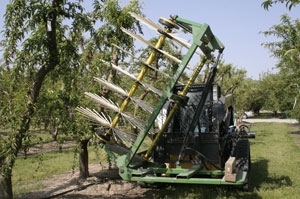 The experiments have shown that a number of factors come into play when using the mechanical thinning device, such as tree structure, age and fruit size. Mandarins may look like little oranges, but scientists believe that their distinct attributes demand special treatment to maintain a fresh, juicy and tangy character. “We think the flavor of mandarins declines much more rapidly than oranges,” said Sue Collin, a UC Riverside staff research associate who is based at the UC Kearney Agricultural Research and Extension Center in Parlier. The way oranges are set out at the grocery store or on home counter tops could be trouble for the more delicate mandarin. And when mandarins make a six-week sea voyage to the Pacific Rim, will Asian consumers find the fruit acceptable? In order to provide farmers, shippers and retailers accurate information about the impact of different storage temperatures on the quality of the fruit, Collin is working with UC Riverside sub-tropical horticulturalist Mary Lu Arpaia and USDA plant physiologist Dave Obenland to understand the changes in mandarins stored at a variety of temperatures, at different humidity levels, for various periods of time. When it comes to understanding the acceptability of fresh fruit, nothing can match the human palette. Collin recruits staff based at Kearney to take a break from their jobs to come to a laboratory built at the agricultural research station specifically for sensory testing. The 1,100-square-foot laboratory features neutral white paint and broad-spectrum lighting. The ventilation system was designed to minimize distracting odors. Inside, six tasting booths each have small windows that open to the kitchen area, where samples are prepared. “We do quite a bit of testing to see if our volunteers can tell the difference in fruit stored at different temperatures,” Collin said. 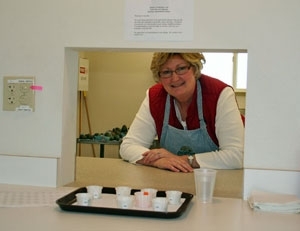 In conjunction with the human testing, Obenland studies the fruit’s chemical composition to find out if objective numerical values correlate with the more subjective findings of the human tasters. Although the optimal storage temperature for mandarins is still under investigation, Collin suggested consumers should keep their mandarins in the refrigerator at home for best results. “I think the flavor holds better and the fruit lasts longer in the refrigerator,” Collin said. This research is being funded in part by the Citrus Research Board. 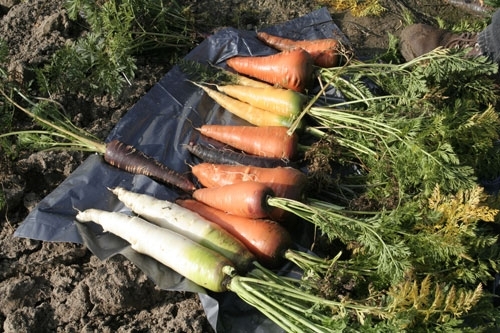 Carrots come in a rainbow of colors. University of California small farm advisors are searching for profitable vegetable varieties that are not commonly found in grocery stores as part of a project that aims to get kids excited about growing and eating vegetables. The program’s five farm advisors will be testing varieties of rainbow carrots, watermelon radishes, party cauliflower and Romanesco broccoli. The crops are grown in a demonstration plot at the Kearney Agricultural Research and Extension Center, as well as plots in Santa Clara, San Luis Obispo, Tulare and San Diego counties. “This is another opportunity to highlight specialty crops that could be profitable for small-scale growers, with the tastes and interests of kids in mind,” said Shermain Hardesty, program director and Cooperative Extension economist at UC Davis. Five schools, which each received a $20,000 “Love Your Veggies” grant from Hidden Valley Salad Dressing, will also be planting and growing the vegetables. The schools and the farm advisors will share their gardening and tasting experiences via blog posts, time-lapse photography in the garden, taste-testing activities and promotion of the program within their networks and local communities. Now in its fifth consecutive year, the Love Your Veggies program is also providing $100,000 in funding to support the UC Small Farm Program as it identifies and grows these vegetable varieties. Hidden Valley created the Love Your Veggies program in 2007 after a study conducted by UC Cooperative Extension researchers found that children in the study consumed more vegetables when paired with a moderate amount of ranch dressing. small-scale farm advisor Manuel Jimenez.